So I treated myself to a new quilt ruler recently called Hexn'more designed by Julie of Jaybird Quilts with which you can cut Hexagons, Jewels and...Triangles! 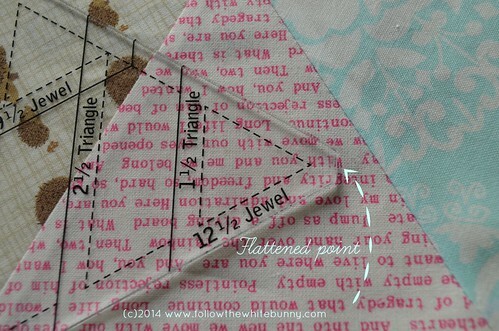 I saw some really neat triangle quilts on Flickr and Pinterest and as I ordered a Low volume Fat Quarter bundle alongside my ruler I thought I would have a go at making a Low Volume Triangle Quilt! 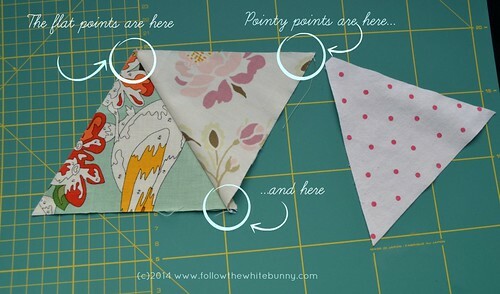 So you start with two triangles with each two pointy points and one flattened point. 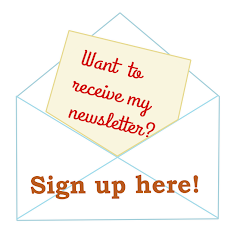 Fold open and press. 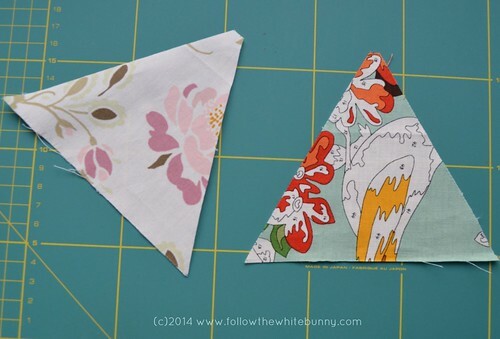 Then put your next fabric triangle on top of the previous one, again right sides together. 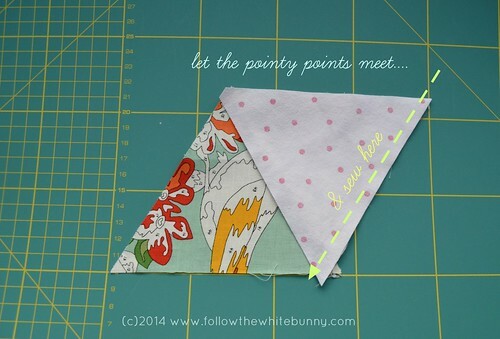 This time you make sure the pointy points of the second and third triangle match. 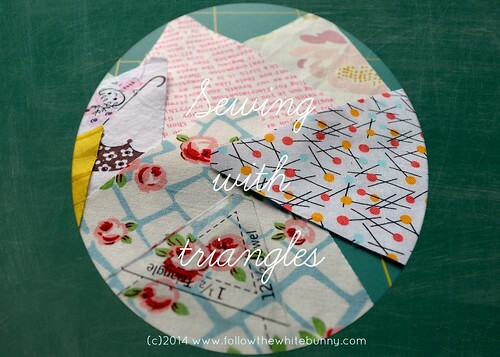 The sewn together triangles should look something like this when you are done. 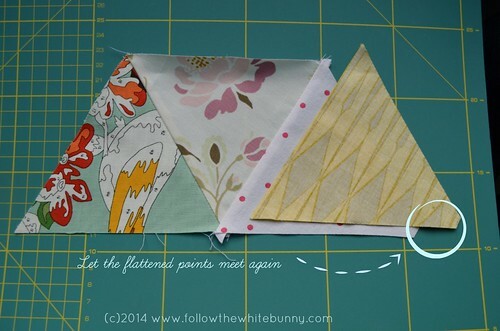 The overlapping bit will disappear into the seam allowance when you sew your rows of triangles together! I am a Confused One too. This Really helped me! 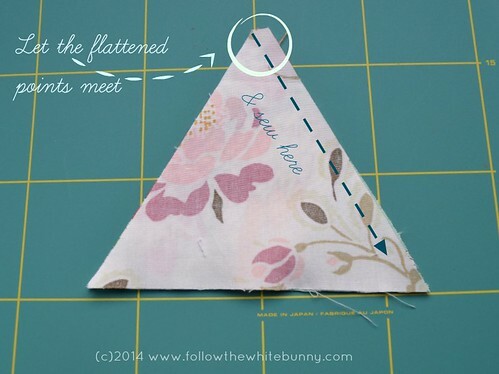 Do you press your seams open or to one side before you sew the next triangle on? Thanks. good question! I pressed them to one side up till now but when I started sewing the first few rows together I had some difficulties sewing them neatly as some of the seams were very bulky when stitched together. 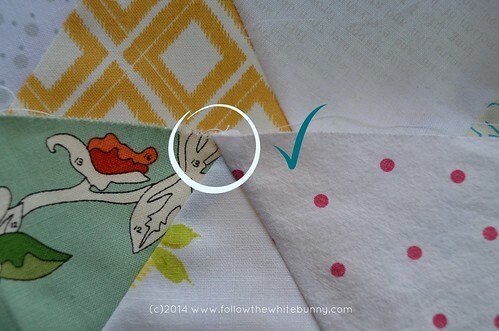 I think I will press the seams open on the next rows and hopefully things will improve! Just found this information of yours and thank you so much because I was soooo confused with those flattened points and didn't know where to put which point. Thanks again - it helped a lot!